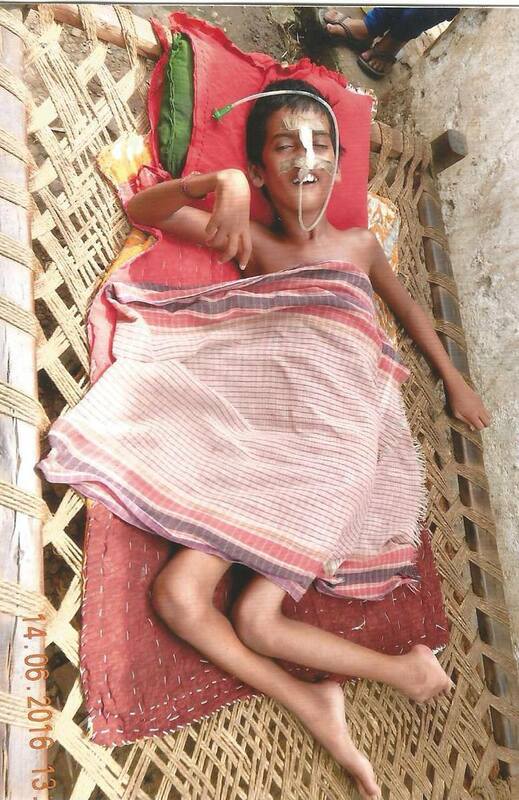 Help 9-year-old Suman fight Japanese Encephalitis & Brain Damage! Eight months ago, when Sri Kamdeo Prasad was still recovering from the sorrow of his wife’s death in 2013, he got hit by another shock: his son named Suman Sourav was diagnosed as having a life-threatening disease named Japanese Encephalitis. Since then, because of deep financial crisis, Kamdeo ji is forced to wander from one hospital to another, from one NGO to another politician. One day in October 2015, after when Suman came back from school in his hometown Birsanagar near Jamshedpur in Jharkhand, India, he complained about breathlessnes and high fever. Kamdeo ji took him to a local hospital, and it was found that Suman was suffering from a rare life-threatening disease named Japanese Encephalitis (JE). JE is a neurologic infection, whose results range from subtle changes in behavior to serious fatal problems. Unfortunately, Suman is one of those unlucky people who are facing one of it’s worst manifestations. According to the doctors, until and unless Suman does not regain his voice and movement, which is expected to happen in a few years, he will have to remain under constant observation and care. He will be needed to change his breathing tube every 15 days, which will allow him to breathe without the use of his nose or mouth. He needs to be fed with the help of a feeding tube through his nose. 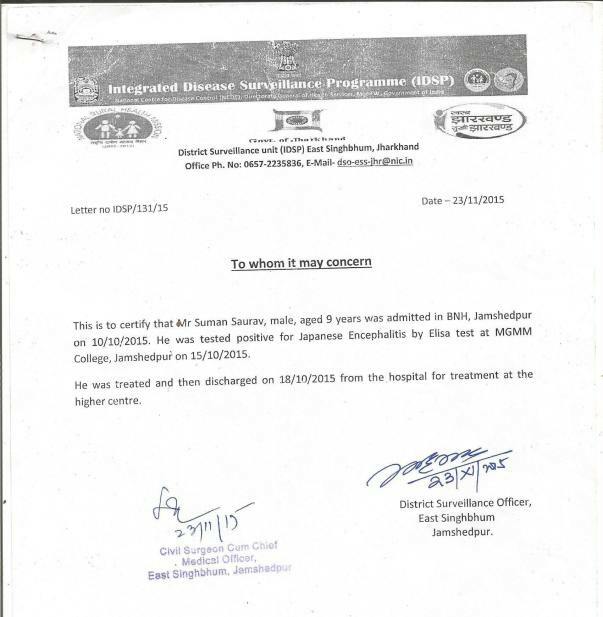 The lowest total estimated expenditure for Suman’s care is Rs 650 per day for 3 years, which is Rs 702000 in total. 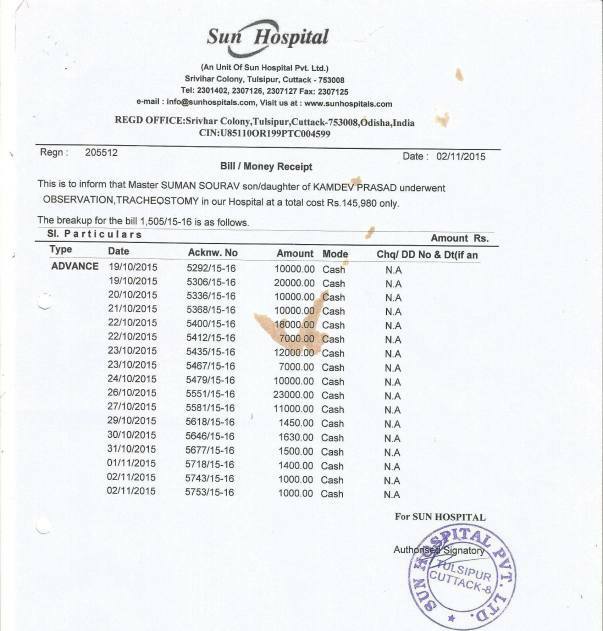 *This expenditure does not take emergency conditions into account, like the time when the family had to spend Rs 7000 in Cuttack for transferring him suddenly in ventilation. [Rs 650 is approximately equivalent to 7.2 GBP and 9.7 USD. Rs 702000 is approximately equivalent to 7875 GBP and 10448 USD. 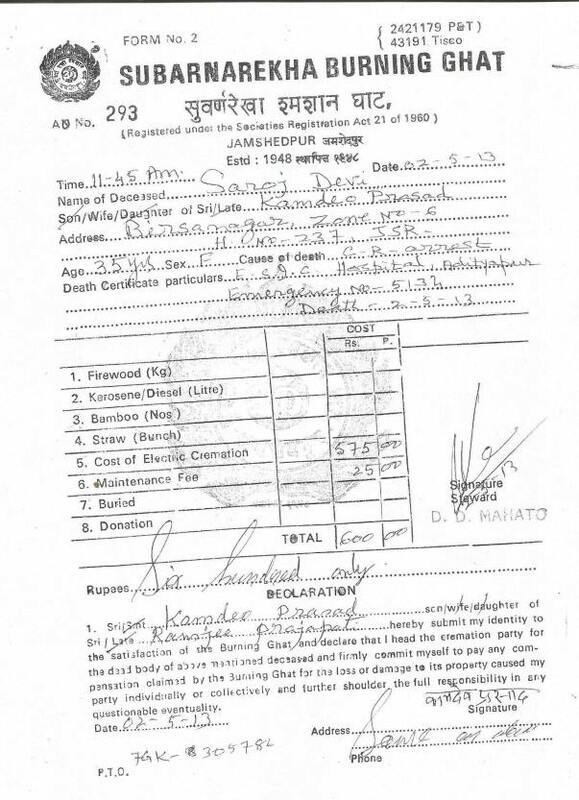 While Kamdeo ji is a worker in Birsanagar, and he merely earns Rs 240 per day (approximately equivalent to 2.7 GBP and 3.6 USD), spending Rs 650 (which is 2.7 times his earning) a day is nearly impossible for him! In 2015, because of lack of infrastructure, Kamdeo ji had to shift Suman from a local hospital to a renowned one in Cuttack, Orissa. Because of the high expenses, he had to sell his land and put his house on mortgage to raise Rs 2,50,000. But unfortunately, soon they were left without much money, and Suman was forced to get discharged from the hospital in Cuttack, and to return back to Birsanagar. He lays motionless in a cot, at the corner of his kapde ki jhopdi (cottage). He can’t move, speak or eat. Neither can he breathe properly. He requires proper care. **This campaign story can never portray the dire need and desperation Suman and his father are going through. You can personally talk to Suman’s father, Sri Kamdeo Prasad, on +91-9155535346. Please help Suman. Any amount of money shared by you will mean more than what you can imagine. Whether its worth a week’s cup of coffee or a cab ride, it will mean life and death to this 9 year old child! Please save Suman! 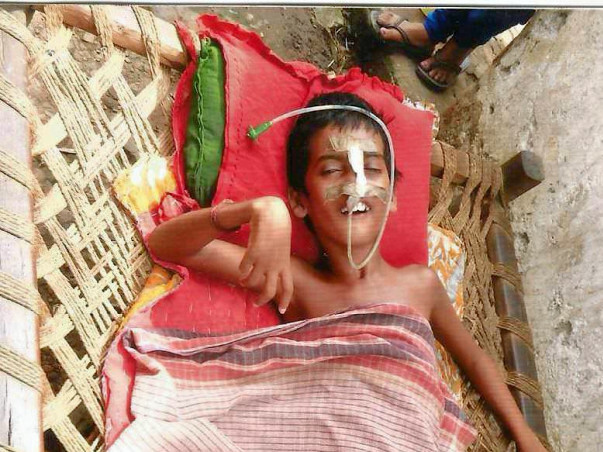 A year ago, Suman laid is his cot in the outskirts of Jamshedpur. He was paralysed and was nearing breath death. Today, he is still in his cot, but things have changed. He has thankfully escaped brain death. His brain has improved drastically. He opens his eyes in curiosity, understands, smiles, laughs, and tries to speak. This is a huge improvement. He hasnt fully recovered from his paralysis. But he tries to pick his body up, and that is also a big improvement. He has gained weight, has become taller and is getting better each day. But the fight is still there. He still needs his medications, checkups and diet, and their resources are draining. But after a year he is not fighting to survive. He is trying hard to become healthy again! Thanks a lot to everyone for your contributions, wishes, prayers, support, empathy and love. It did mean life to him. Suman's father, Kamdeb ji and myself are grateful for everything. If you want to make contributions, because the need for money is incessant then please reach out to me through the option on the page. Once again, thanks a lot for #SavingSuman! Here is an update on Suman's health. Suman is doing good progress. He shows emotions, laughs and gives expressions. He tries to speak. He is now able to try to lift his body on his own. This is a very good improvement coming from the time when he was paralyzed and was on the verge of brain death. Suman's family, especially his father Shri Kamdeo Prasad ji and I are very thankful to everyone for their support and contributions. It has made a very promising impact and has been successful in saving Suman. We are very grateful. Many thanks for everyone's support and generosity. We have raised a big amount, and are very happy and thankful about it! Suman's father has expressed deep gratitude for everyone's contributions and prayers. In his words: "I had lost all the hope in this world. Now, you all have given me a lot of hope to keep trying. I think that Suman's treatment is now satisfactorily possible to be continued for a long time. Thanks to everyone". Suman is now recovering. His treatment is satisfactorily going on, and we can hope that he will recover and live happily in recent years. 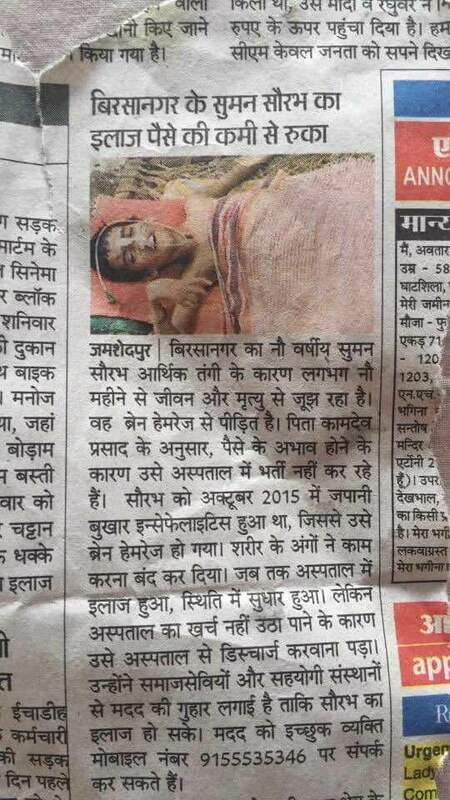 In a week, he will be taken to Aurangabad in Bihar to consult a renowned doctor regarding his disabled body. At last, I would again like to thank everyone for their support. Good luck with this noble endeavour!